Maybe you drive a vintage vehicle that’s prone to road drift–or a state of the art electrical-hybrid with an advanced driver assistance system. No matter your situation, our technicians can help. They’ll explain every aspect of your alignment problem, in a language you can understand and with the friendliness you can come to expect from Johnny’s. Our bays are pristine, and our waiting area is comfortable, with complimentary coffee and Wi-Fi available to all of our customers. 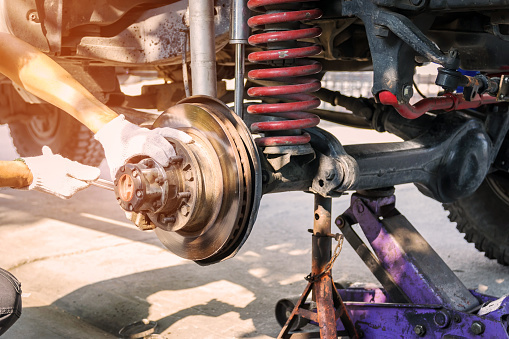 Whether you’ve searched only for the phrase “alignment shop near me” or are on the hunt for a new mechanic who can perform all of your vehicle’s scheduled maintenance, we’re here to help. Your experience in our shop will be so pleasant that you’ll wonder why you didn’t stop by sooner. Johnny’s offers Wheel Alignment in Azusa and so much more. To schedule an appointment, contact us today. You can reach us online via our appointment request form, or call us at (626) 966-5212. With appointments available Monday through Friday, and after-hours drop off available for those with busy work schedules, we’re here to help you get your car back on the road in no time.